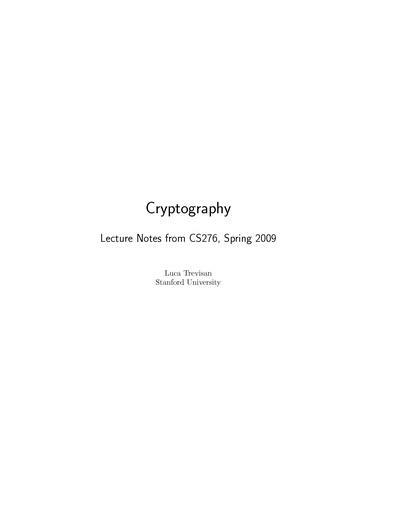 Notes from a graduate course on Cryptography offered at the University of California, Berkeley. Familiarity with the notions of algorithm and running time, as well as with basic notions of algebra, discrete math and probability is required. More resources are available at the course webpage. Trevisan wrote:This course assumes CS170, or equivalent, as a prerequisite. We will assume that the reader is familiar with the notions of algorithm and running time, as well as with basic notions of algebra (for example arithmetic in finite fields), discrete math and probability. General information about the class, including prerequisites, grading, and recommended references, are available on the class home page. Cryptography is the mathematical foundation on which one builds secure systems. It studies ways of securely storing, transmitting, and processing information. Understanding what cryptographic primitives can do, and how they can be composed together, is necessary to build secure systems, but not sufficient. Several additional considerations go into the design of secure systems, and they are covered in various Berkeley graduate courses on security. Professor of Electrical Engineering and Computer Science at U.C. Berkeley and senior scientist at the Simons Institute for the Theory of Computing. Studied at the Sapienza University of Rome, advised by Pierluigi Crescenzi. Took a post-doc at MIT (with the Theory of Computing Group) and at DIMACS, joined as an assistant professor at Columbia University and a professor at Stanford. Interested in Theoretical Computer Science.